Water should be your go-to drink. Stop reaching for sugar-laden juices and sodas and cut down on the cocktails if you’ve been experiencing bloating, weight gain, or moodiness. Your diet will affect all three. Staying hydrated helps to rid the body of toxins, improve your complexion, and regulate moods by ensuring that you aren’t falling victim to blood sugar spikes and crashes. 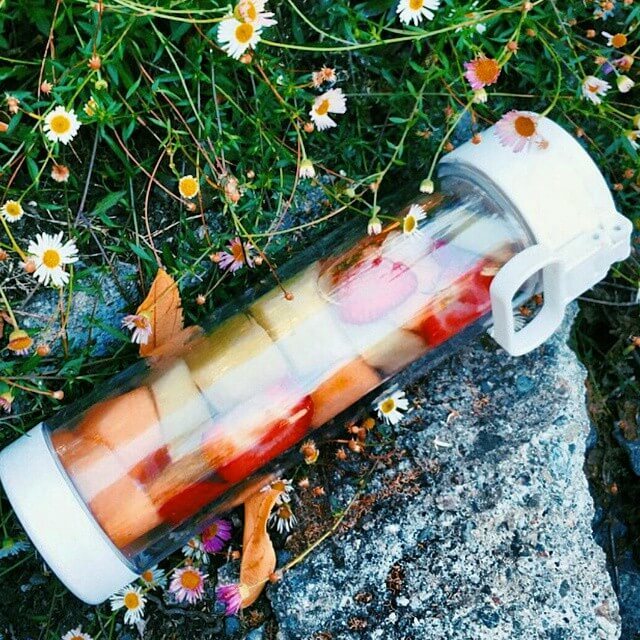 Infusing fruit into your water is a great way to add flavor if you’re having a hard time meeting your daily intake. Pick your favorite fruit and infuse for at least 30 minutes, or longer if you prefer a stronger flavor. A cucumber, lime and lemon mix will keep your body hydrated and happy. These fruits also help with weight management, appetite suppressing, bloating and digestion. Recovery is one of the most important, but overlooked, keys to a healthy lifestyle. Proper recovery time and recovery fuel helps you get the most out of your workout and gives your body and mind the fuel you need to conquer tomorrow. How does fruit-infused water impact recovery? Fruits are beneficial to just about every part of your health and they contain antioxidants and important vitamins. Vitamin C is essential to recovery, as it improves and strengthens your immune system and keeps you feeling energized. To promote recovery and enjoy a sweet-tasting drink, infuse oranges into your water. If you’re looking to start a healthier diet and kick the sugar or carb habit to the curb, detox drinks are a great place to start. While we don’t recommend following a fruit-infusion diet for longer than three days (your body does need the essential nutrients provided by whole, clean foods), it can be a great - and cheap - way to rid yourself of extra toxins and prepare your body for something new. The best part is you can infuse any of your favorite fruits into your drink. Play with different combinations and recipes and find which ones taste best to you. To maximize the benefits of your fruit infused detox drink, create a recipe that combines fruit and another fat-burning or appetite-suppressing ingredient, such as cinnamon. An apple cinnamon combination can be a tasty and refreshing treat. You can make your servings a single Glasstic water bottles, or you can create your three-days’ worth of detox water by using a fruit infusion pitcher and then pouring it into your bottle to enjoy it on the go. Another well-known benefit of staying hydrated and eating plenty of fruits and vegetables is clearer skin and reduced wrinkles. Since our bodies are predominantly water, staying hydrated results in healthier skin because your water intakes helps regenerate new skin cells. Sugar can cause a breeding ground for acne and blemishes. The negative effects it has on your body can be seen on your skin. If you’ve been suffering from an increased amount of acne but can’t quite figure out what the problem is, take a look at your diet. Below we’ve compiled some recipes to help you in your fruit infusion water search. Try these below or make your own - there’s no wrong way to drink your fruits. This water recipe is a popular and beneficial one. Lemon aids in digestion and increases your metabolism. Infusing more lemon than cucumber and lime will give the water a more tart taste but increase the benefits you get from it. We recommend mixing equal parts of all fruits. Ginger is a great ingredient to help with digestion and weight loss. Ginger can also help with nausea and morning sickness - remember how often you’ve reached for that ginger ale? This is a great, healthier alternative. Add mango to the mix for a sweet, tropical flavor. This recipe is reminiscent of apple cider with its spicy and fruity qualities. If you’re not already consuming cinnamon as a spice on your foods - you better start, and this is a great way to supplement your intake. The popular spice is known for its many benefits, including lowering cholesterol and fighting diabetes. An apple a day may not keep the doctor away completely - but it will certainly help. Apples are high in antioxidants and Vitamins C and B complex. Have a taste of fall with this wonderful combination. This is a sweet treat with a kick of Vitamin C. Use Mandarin oranges for a twist. Skip the lime and add cilantro for a clean, light and refreshing taste. If you have a lot of cilantro in your fridge that you have trouble using before it goes bad, this is the perfect way to put it to good use. We hope you’ve enjoyed the suggested recipes and information about fruit infusion. The best thing about fruit infusion is that you can make it entirely your own - no need to follow a recipe or specific serving sizes. Drink what tastes good to you. Have you tried any of the above recipes? What are some fruit infusion drinks that you’ve created?